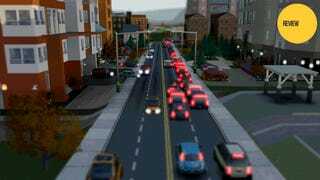 I love watching the streets of SimCity 2013. The cars and people zipping by, streets stretching to the horizon. Look too closely or zoom out too far, and the game's problems are impossible to miss. I'd stay on those streets forever if I could, but there's a review to update. Presented here is my original SimCity review from March, which once carried a "Not Yet" verdict, with a fresh update that closes the door on our long city simulation struggle. Scroll to the bottom for the update.